Corporate Flight Training are a UK CAA approved Cabin Crew Training Organisation (CCTO 007) and are able to issue the Attestation of Cabin Crew. The Cabin Crew Atesation (CCA) is valid in all European countries and for all European airlines. The course includes all the generic safety training modules that are usually provided by the airlines. In doing so this reduces the airline training time and cost leaving only the aircraft type-specific and company procedural training to be covered when you are employed by your airline or aircraft operator of choice. The Cabin Crew Attestation is becoming more frequently requested for both airline and corporate jet cabin crew. We have two options for training based upon the level of candidate experience. We deliver two monthly Attestation of Cabin Crew courses. Six days CCA Course – this is suitable for candidates with no prior experience or for those who have taken a leave of absence from flying. Many airlines now hire candidates who are in possesion of a valid Attestation of Cabin Crew. This means the company training time is cut down as the company are only required to conduct an operator conversion/aircraft type training. Holding an Attestation of Cabin Crew also demonstrates knowledge, commitment and gives candidates excellent cabin crew employment prospects. Five days Advanced CCA Course – this course is suitable for candidates who have been cabin crew previously and for corporate/business aviation and VVIP flight attendants. For corporate aircraft operators of 19 seats or less, by employing Flight Attendants who hold an Attestation of Cabin Crew the operator can utilse them as Cabin Crew who are able to participte in safety related duties, as this just leaves the company to complete the conversion/type training. All candidates will receive a 55-page pre-course study booklet to get you started on your Cabin Crew journey and to prepare you for the course. 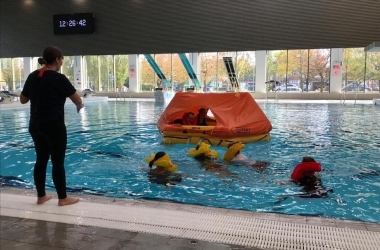 The course includes a wet drill performed in the swimming pool, an opportunity to get to grips with flotation equipment, aircraft life rats and survival equipment. Each candidate will receive a copy of the CFT operations manual which is yours to keep and take away. Will it help me find a job as cabin crew? Absolutely, many airlines are now starting to recruit candidates who are the holders of an Attestation of Cabin Crew. It is truly an investment in your future career and looked upon favourably by airlines and aviation recruiters. In the corporate aviation industry many companies now look to utilise Flight Attendants with an Attestation of Cabin Crew, regardless of seating capacity, in order for them to function in all safety related duties. Throughout your course you will be tested to consolidate your learning and understanding of the subject. On the last day of your course you will complete a final examination which must be passed in order to be issued with the Attestation of Cabin Crew. The course is extremely regulated and does require a high level of competence. Don’t panic, if you fail a modular test or the final examination you will be given an opportunity to resit. Our team of instructors are on hand to mentor, coach and guide you every step of the way to ensure you are fully confident and are able to pass the examination with flying colours. The following modules are covered during your training course, if you would like a more in-depth syllabus please do not hesitate to contact us. The cost for this course is £700.00 GBP. CFT are currently working with a number of colleges and academies. We have a discounted rate for colleges, please contact us for further information. Book a place on this training course using the online booking form or contact Corporate Flight Training for further information.